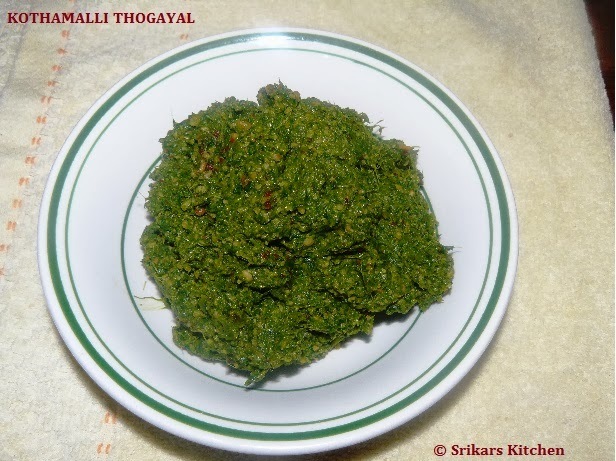 KOTHAMALLI THOGAYAL- It is very tasty & tangy-spicy thogayal. It is a one of the best combination for curd rice. Now a days i am making this thogayal weekly once and use for 3-4 days. Heat oil in a pan, add urad dal,red chillies & roast it until golden brown.Keep it aside. In the same pan ,add coriander leaves & allow to sweat. Take a blender add roasted urad dal, red chillies,coriander leaves,salt & hing. Grind a coarse paste & serve with curd rice, idly or dosa. very very flavorful and delicious thogayal :) tempting me ! !